In October, during a road trip around Oregon, I had the opportunity of visiting the Latimer Quilt and Textile Center in Tillamook. If you are a quilter, and are visiting this area, this is certainly a “must see” for the itinerary. The museum includes beautiful quilts on display, as well as numerous other textile arts. They also have a gift shop where I acquired the centerpiece for this quilt. The cross-stitched sampler centerpiece had an identical twin, each measuring about 12″x12″, and while the orange and brown stitching was complete on both, the background had not been finished. Like my Lovely Flower Baskets in the Window quanket, I was amazed at the time someone must have spent on these, and wondered at their plan for them. As a fan of re-purposing, I knew that these were destined to make their way into my Love Hugs (Pieces of the Past) quilt project. So, I scooped up these beautiful little treasures, and figured I would finish cross-stitching the background. I chose to do this as a medallion quilt, as I wanted the cross-stitched center block to be the main attraction. The Fall-colored leaves material used in the last large border and throughout, was a leftover from my sister Lynn’s donation for my Country Fair quilt, and the large gold triangles was material I had received for participating in the 2015 Hands2Help Challenge. This quanket was donated to the County of Ventura, Children & Family Services, for a foster child in December 2015. I am intrigued by hexie quilts, but doing a Y-seam or paper piecing method intimidates me. For this quilt, I used the 60-degree angle method, although I think I conceptualized it a bit different than how I have seen others use the 60-degree method. I cut my pieces so that I could work with blocks, since I am so accustomed to block quilting (shown in pic below). If you are looking for a good hexie tutorial, check out Kim’s blog over at Magnolia Bay Quilts. The fabric I used is wool, which I do not consider to be a very traditional quilting material – I suspect this way of thinking is perhaps influenced by my American upbringing. I had come across TheEclecticAbuela’s blog a while back, and was thrilled to learn that it is not uncommon to use wool in making quilts. And, the story and origin of Wagga Rugs is fascinating. Years ago when my brother-in-law’s mom Virgie passed away, I had been given stacks of wool that she had planned to use in making men’s suits. Over the years, I had used some to make a pair of slacks and a jacket for myself, but I still have stacks and stacks of this beautiful wool. 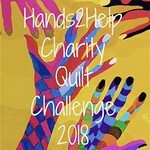 I am so excited that I can put this wool to use in my Love Hugs project, and I suspect that Virgie would be excited as well that this quilt will give a foster child warmth and comfort. I was amazed by the finished weight of the quilt, which is considerably heavier than the usual cotton blend quilts that I make. I look forward to making more Wagga Rugs from Virgie’s wool! Virgie’s Wagga Rug quanket was donated to the County of Ventura, Children & Family Services in December 2015. What is a Veteran? A Veteran – whether active duty, discharged, retired, or reserve – is someone who, at one point in his/her life, wrote a blank check made payable to “The United States of America,” for an amount of “up to, and including his/her life.” That is honor. Today I honor all those that have served our nation – past and present – in protecting my freedoms. The quilt shown above, is one that I made years ago, and it hangs on the wall in my office/sewing room, as a reminder to me that freedom is not free.